It snowed, a somewhat rare happening in Downtown Seattle. It began about 8:00 in the evening and it was coming down pretty good. I have an amazing view out my window of the Amazon Biospheres and my first thought was “SNOW GLOBES! If we get enough snow I have to get a photo of the Amazon Biospheres covered in white. They will be like snow globes!” So I got my camera and tripod ready and I waited. To my pleasure, we did get enough snow. I sent a quick photo email over to a friend at the construction company building the domes, thinking he’d love the view and the snow covered magic. Friday afternoon I get a call from none other than…Amazon. My friend had shared the photo with his team and client and Amazon wanted to know if they could use the photo on social media for promo. Oh, but of course, right? I freaked out. “…great pic.” The Amazon contact apologized for being coy…I forgave! Twitter blew up. My friends and family all got excited. 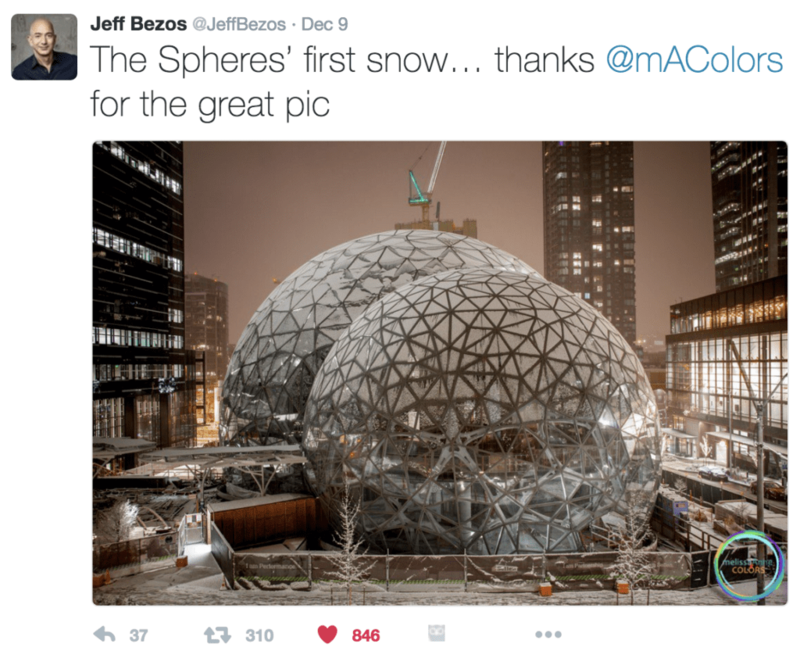 I thought it was really cute that the Amazon Biospheres are like children and he’s celebrating their first snow. AWE. But mostly…I freaked out. And then there was the next email that delivered to my inbox. A rejection email from a local art gallery I had submitted to weeks ago. I could have let this overshadow my excitement. That sting of rejection countering a notable “…great pic.” It’s easy to do as a creative, sit with the critiques over the acknowledgements. But, because of my year of growth, perspective and discovery I knew there was a lesson and a message here. My Coloring Out Loud process message reverberated through my head. Sometimes we intentionally try something. Deliberately acting with a desired outcome. Sometimes we just organically act. Sharing ourselves with no expected outcome. It was another piece of the message. Keep being deliberate. Keep being your organic self. Let go. What’s supposed to happen, will happen. I love the message. It’s validation to keep going. To keep putting myself out there. Intentionally or not. Every moment is an opportunity. Be genuine and live authentically and follow the moments. And then….I let go and CELEBRATED…again thanks to those Amazon Biosphere “snow globes” and Jeff Bezos. The gift that keeps giving. With and without expectation of outcome. Let go and let it go! Because, not everything ends in a rejection. Sometimes, well, you get things like Bezos and GeekWire. Not to mention some really great insight and wisdom. Thanks, Jeff, for making 46 quite memorable and validating my dream and my passion. More exciting news is coming about melissaAnne COLORS Photography. Look for it in your inbox soon!